living room. Queen sized double bed in the master bedroom. Ocean front view from the private balcony. Unit L-236 is a second floor condo; has elevator. HDTV with DVR and DVD that are HDMI capable for your PS4, Xbox, or PC. Laundry facilites available on the lower floor. Game room. Elevator. No pets please. We supply all linens, pots and pans, dishes, etc. plus we pay all fees. The rental price is it and includes everything but the $110 cleaning fee. This is the family resort you've been looking for. So much to do and enjoy and then back home to the condo to rest up for the next day. We raised our 3 boys there and continue to use it ourselves in the Fall and Spring. The resort is extremely well maintained year round. For families with children this is an ideal spot. There usually is a free morning activity camp for kids in the play ground area. You and the kids will also enjoy the 9 hole miniature golf course, basketball, tennis, and water slide. If the weather is bad or the surf too rough, there is the heated indoor pool and 8 person spa. Like to cook out? Visit the many modern BBQ grills. And finally, the resort is private with full, around the clock, on site security. We have the condo professionally cleaned and detailed between each quest. When comparing prices, please note that we provide your linens and bath towels. There is a full kitchen with dishes, pots and pans, and table ware. This is a very unique spot. It's not touristy and congested like say Myrtle Beach, yet you don't miss out on the amenities. This resort has the only water slide for miles. Free tennis, basketball, miniature golf, bbq grills, and hot tubs. Need a water board, basketball, tennis racket, putting iron? Just borrow one from the activity center. From our front door it's approximately 100 yards (or the length of a football field) to the surf. 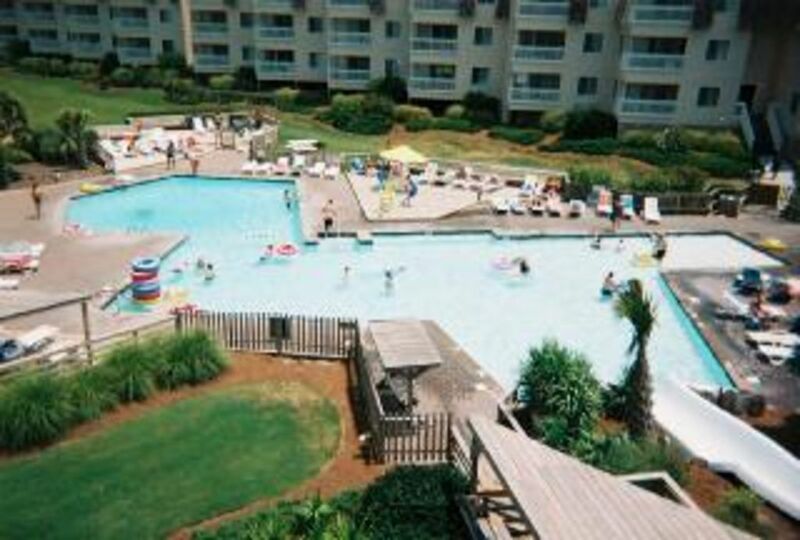 Our condo is located in the resort "A Place At The Beach", in Atlantic Beach, NC. This is off the beaten track and offers outstanding, family oriented amenities; ALL FREE to guests. Great view of the beach and ocean from the balcony and living room. This condo is within 100 yards of the beach via boardwalk. Fresh water showers are located on the boardwalk to rinse the salt and sand off your feet. This complex is located on the beach. It is HIGHLY advised that all guests bring extra towels for the beach. Full galley kitchen with dishwasher, microwave, coffee maker, stove/oven, and fridge with ice maker. Two TV's. One in the master bedroom and one in the living room. The Place At The Beach (APATB) is an exclusive, gated, complex with private security personnel on duty at all times. Complex offers a heated indoor pool, a near olympic sized outdoor swimming pool (see photos) with water slide, charcoal grilling facilities, boardwalk to the beach with shower facilities, park like grassy field for frisbee and play. Childrens play area. Basketball and tennis courts. Entire complex offers free WiFi high speed internet connection. Private movie showings on Thursdays. Numerous youth activities plus optional day camp. Small convenience shop on premise. Located in Atlantic Beach, North Carolina, APATB is easy to get to. By car just take Hwy 70 east from I-95. The New Bern airport (EWN) is only 32 miles away. Condo worked well for our employees! Great location and comfortable spot for our employees. Thank you for your quick response during the rental process. The off-season on the Crystal Coast provides a great opportunity to enjoy the beach and surrounding area . . . without all the crowds. And the chance to stay in a nice condo right at the beach for an off-season price . . . can't beat it. Definitely loved the ocean view, being right on the ocean and so close to Fort Macons hiking trail. So beautiful. Very small kitchen...and I love to cook...I stayed for 9 weeks (Nov-Dec), so i would of appreciated a little upgrade to that kitchen. But, it would be perfect if you are on vacation for a short time. There is a dollar tree and grocery store less than 5 min drive away so you get all your needs. One weird thing I noted was the beds, couch, toilets and bathroom sinks are all very low. Also no windows in the bedrooms, I really like to fall asleep with windows open and to the sound of the ocean. I did purchase a mattress topper for the bed since I was staying a longer stay. The complex has a lot of out door actives (tennis, basketball court, hot tub, mini golf....) so I see families really enjoying that. Lots of bars and restaurants close by (driving) even in the off season. And the people around the area are very friendly and the area has so many places to explore. We thoroughly enjoyed our stay. The condo had everything we needed for a comfortable stay and a memorable week. The beach is beautiful. If you head east up the beach, just a few minutes walk, you'll reach the pristine beach of Fort Macon State Park. No condos or hotels, just sand, ocean, dunes and shells! Beautiful! We will definitely be back. A "Place at the beach" was a nice place to stay. It had most things 2 sisters on a getaway would need. The kitchen was well stocked with all the kitchen staples like pots and pans that we needed. On the negative side the buildings can get noisy when more people are around. All in all though it was a really nice place and the distance to the beach was great. shore after the last tide. a charming sea side community with world class restaurants, antique shops, and historic places to visit. There is a mandatory cleaning fee of $100. We make nothing on the cleaning fee. It is passed 100% to the cleaning and linen contractors. We provide bath towels and linens. We are at least $300 below marker for a similar unit.